The Bahamians often end a conversation with, “No Problem, Mon.” Unfortunately when there is one problem after another on a boat, it’s difficult to embrace this attitude. We thought our Internet problems would be solved when we got our air card. We went to Batelco yesterday to get the sim card for it. We bought the sim card, paid for a month of data for $40, and the Batelco person, Miss Thompson, set it up for my Mac. The air card connected to the Batelco system quickly. Then we waited and waited and waited and Miss Thompson said we had to be patient. Finally a website came up. We left the Batelco office assuming it was working and hoping for more speed next time. Back on the boat, we tried to get online and it was beyond slow. It was beyond dial-up slow. I tried to get email and got nothing. I tried to get online this morning and still got nothing, although the air card software indicated we were “connected.” In the meantime, I paid for another three days on the Exuma wifi network which is fast, if not always reliable. I am hoping that the Batelco data system is “down.” Otherwise we wasted money and time getting this air card. At least we were able to get the wifi extender working because without that we couldn’t get the Exuma wifi from our boat. We’d have to join other cruisers without wifi extenders sitting with their computers on the porch at the Staniel Cay Yacht Club, close to the signal. That, however, is the least of our problems. We have new solar panels and new batteries, which we hoped would give us enough voltage to rarely have to run our genset to charge the batteries. It has been sunny and while the days are still short and the sun is low in the sky, we are getting great charge from the solar panels. 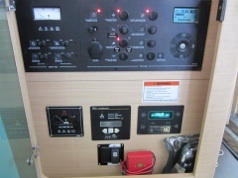 However, from the batteries to the DC bus, where the charge is sent out to the 12V system the voltage drops substantially. 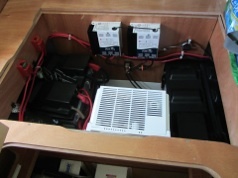 In the photos, the five batteries are at the left, under the aft cabin bed (currently our pantry). The bus voltage readout is below on the upper right of the cabinet. It is usually almost 1 V less than the voltage measured directly from the batteries. Today Mark is going to try putting a new larger cable between the batteries and the bus. Staniel Cay does not have marine stores or even much of a hardware store, just a few shelves of marine and hardware items in Isle General. Yesterday Mark asked about getting a cable at the Staniel Cay Marina and ended up talking to the infamous “Chubby.” Anyone who has been to Staniel Cay has heard the call on VHF channel 16, “Chubby, Chubby, come in Chubby.” He is the mechanic at the marina. Chubby gave Mark a thick battery cable which we hope will solve the problem. We haven’t paid for it yet because Chubby told us to see if it works and then we could pay. If this doesn’t solve the voltage drop problem, we might have to go to Nassau to have an electrician look at it. The weather has finally calmed down enough that we can leave Staniel Cay and comfortably go north or south. However, until we see if Mark can fix this voltage problem we don’t know if we have to go back to Nassau or if we can leave here to anchor near another beautiful cay. 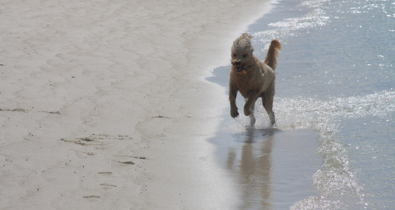 (Cay, by the way, is pronounced “key.”) Daisy doesn’t really care where we are as long as she can race down a beach with her ears flapping in the wind. 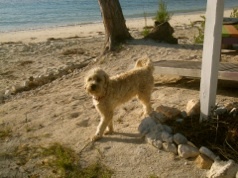 We met a cute little dog yesterday in Staniel Cay. She didn’t have the usual pit bull mix look and in fact looked similar to Daisy so we asked her owner what breed she is. He answered, “She’s a potcake,” which is what the Bahamians call all their mixed breed dogs. This name, we were told, comes from food that was left in the pots Bahamians cooked their meals in which they scraped out in a cake and fed to their dogs. She seemed to have some characteristics of a Goldendoodle, so perhaps some cruiser dog met up with a potcake and they had a Potdoodle.